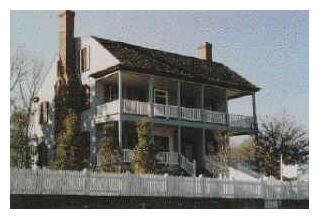 The Ezekiel Harris House, Circa 1797, is a reminder of the days when tobacco was the primary cash crop in Georgia. Following the Revolutionary War, the area which now includes Wilkes, Elbert, Franklin, Lincoln, Warren Oglethorpe and Greene counties was opened for settlement. Liberal land grants and rich soil attracted tobacco planters who had depleted their farmlands in Virginia and North Carolina by planting tobacco year after year. Towns sprang up around the tobacco inspection stations and warehouses. Tobacco merchant vied with tobacco merchant and town competed with town for the market. Competition was very fierce between Augusta and Harrisburg.